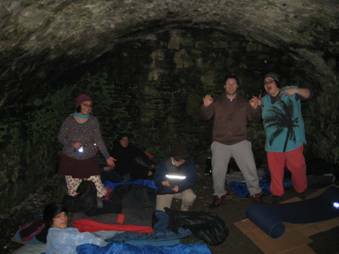 Saturday, 9th February saw 8 people brave the cold to do the Manna House sponsored rough sleep at Kendal castle. The evening kicked off with a hour of prayer and worship with people from many different churches around Kendal gathered together to pray for the homeless and vulnerable adults of our community. We were joined by the band from St Thomas’ Church who led us in our worship. When the time came to set off, we gathered together at Castle Lodge and walked up to the castle together clutching our pieces of cardboard and sleeping bags. We made beds for ourselves with the cardboard on the cold ground and sat around telling stories and laughing. The night was long and cold and tested our endurance but the relief of the walk back the next day and the hearty breakfast cooked by Jonathan & Fiona and Matt made it all worth it! We have managed to raise just under £1,000 and the ‘just giving’ page on the internet wont be closed until the end of the month so we expect more will come! Many thanks to those who slept rough and to all who sponsored us.